An excellent opportunity has arisen to become part of the Obstetrics & Gynaecology Team at The Shrewsbury & Telford Hospital NHS Trust. The Trust is proud to have been working collaboratively with the Virginia Mason Hospital in Seattle, widely regarded as one of the safest Hospitals in the World. This partnership was established in 2015 and we have developed a number of ‘Value Streams.’ Doctors, Nurses, Allied Health Professionals and colleagues from Virginia Mason are working together to transform Healthcare at The Shrewsbury and Telford Hospital NHS Trust and share our learning across the Country. We are one of five trusts across the UK working with Virginia Mason and NHS Innovation. This post is designed to train in the methodology of continuous improvement (Transforming care Production System, TPCS) that underpins the Virginia Medical Institute (VMI) approach to Healthcare transformation. The Post is aimed at applicants looking for a post at ST4 level or above. This is a challenging post that will test skills that are not the focus of most clinical training roles, yet are highly relevant and transferable to more senior clinical roles and career progression. 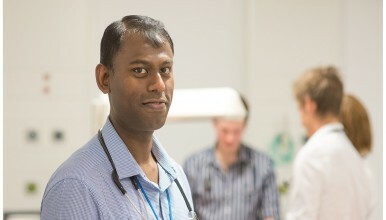 The post also requires the ability to work independently in all aspects of the Specialty on a sessional basis including Gynaecological outpatients, Antenatal clinics, Day Surgery and major Inpatient lists along with Specialty Clinics and be part of the middle grade 24 hour on-call for the Labour Ward Practice and Obstetric and Gynaecological Emergencies. You will also be given ample opportunity and encouragement to develop your own Specialty interest with specific allocation of time on a sessional basis over and above protected CME time. Ideally the successful applicant will be able to perform colposcopy independently. The Consultant Obstetric Unit is based at the Princess Royal Hospital. In addition there are 5 midwifery units in Shropshire and two in mid-Wales in the catchment area (PRH, RSH, RJAH, Ludlow, Bridgnorth, Newtown and Welshpool). In 2017/18 there were 4060 deliveries in the Consultant Unit and about 500 in the midwifery lead units. The Consultant Maternity Unit currently has 14 Consultants responsible who are responsible for acute labour ward and gynaecological practice. Consultant presence on the Labour Ward is 76 hours a week. It has a very active maternal and Fetal medicine unit run by 3 of the Consultant Obstetrician/Gynaecologists, 2 of whom are sub-specialty trained in maternal and Fetal medicine. Antenatal practice is divided into specific speciality clinics to which expectant mothers are triaged. Routine and detailed scans with invasive diagnostic procedures are performed within the department. Specific antenatal clinics are supported by consultant physicians and nurse specialists. Neonatal designation is a Local Neonatal Unit (level 2) working in conjunction with Neonatal Intensive Care Units in the Royal Stoke and Royal Wolverhampton Hospitals as part of the Shropshire Staffordshire and Black Country Neonatal network. There is a comprehensive governance structure incorporating risk, guideline writing and continuous audit. Consultant presence on the Labour Ward during working hours is in blocks of 5 working days 08:30-17:30 with evening sessions till 21:00 and 08:00-16:00 on Saturdays and Sundays. Out of hours non-resident on call is a 1:12 rota. The gynaecological inpatient unit is based at the Princess Royal Hospital. There are 12 beds with the use of further beds in the day surgery unit at both the Royal Shrewsbury Hospital and Princess Royal Hospital. In 2017/18 1909 day case procedures were performed; 579 elective inpatient procedures performed; 1,550 non-elective patients were seen or admitted; 7,079 new outpatients were seen, 11,290 follow-up patients were seen and 11,913 procedures were performed. All consultant gynaecologists have operating lists at PRH and 7 have Day Surgery lists at RSH. Consultant outpatient clinics are conducted at RSH, PRH, Ludlow Community Hospital, Health Village in Oswestry, Newtown Community Hospital, Welshpool Community Hospital, Market Drayton Community Hospital and Whitchurch Community Hospital. Currently there are 13 full time consultants conducting gynaecological practice with 2 part-time (2 sub-speciality trained oncologists whose primary contracts are with Royal Stoke and Royal Wolverhampton Hospitals). The gynaecology service has an active assisted conception (fertility) unit which supplies a full range of techniques with excellent results. There is specific consultant-led practice in cervical pathology; oncology; fertility; urogynaecology; psycho-sexual medicine and full facilities are available for the support of minimal access gynaecological surgery. There is a very active ambulatory care unit performing Myosure; Novasure; Essure and other outpatient techniques. Early pregnancy assessment is supported by nurse lead practice in both the PRH and RSH. Outpatient Facilities: Full antenatal clinic facilities with on-site ultrasound capability are established at both RSH and the Wrekin Unit at PRH. Gynaecological outpatients are held at both RSH and PRH. Consultant delivered antenatal and gynaecological clinics are run at Ludlow Community Hospital, Newtown Hospital and Welshpool Hospital. Gynaecological clinics are run at Market Drayton, Health Village in Oswestry and Whitchurch. We are located between the north and the south making travelling around the UK easy. As well as being a short distance from major cities and busy transport links including Birmingham airport, our county also borders with beautiful north Wales which is abundant in outdoor activities, brilliant beaches, and thrilling scenery.